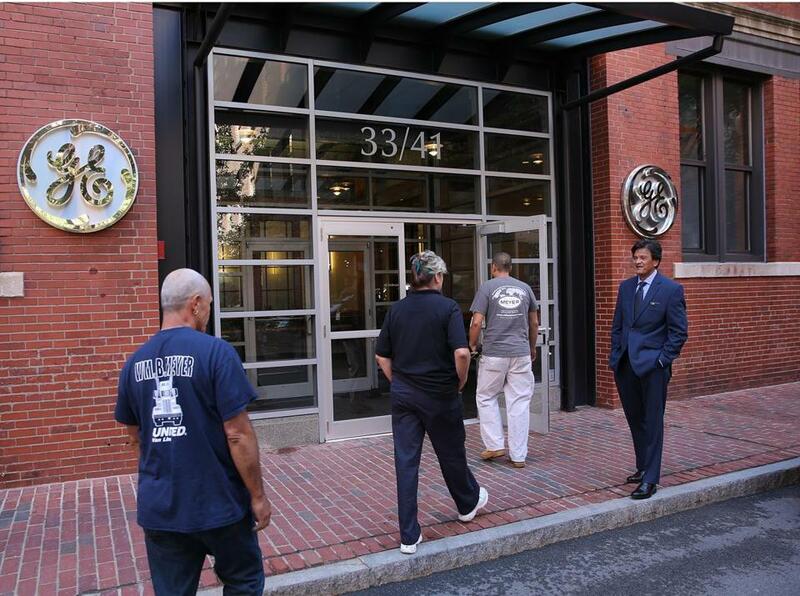 General Electric Co. has set up a temporary headquarters on Farnsworth Street. General Electric might end up skipping the expensive second phase of its headquarters project, especially with a new CEO in charge. Those tax breaks for the new building? GE could still land millions. GE is renovating and uniting two old brick buildings next to the site, with a goal of moving in next year (with help from up to $125 million in separate state funds). There will be enough room to accommodate the 200-plus employees who work in the current headquarters a few blocks away. It’s that second phase — the bold tower with the giant solar sail and the big GE logo on top — that remains up in the air. Chief executive John Flannery delayed construction of that portion by two years, as he moved to dramatically pare back GE’s size with a parade of divestitures. He apparently didn’t move quickly enough: The board replaced him last week with former Danaher CEO Larry Culp amid a prolonged stump in the stock price. The tax breaks kick in during the city’s 2019 fiscal year, which began on July 1. GE paid $713,000 in taxes for the tower site (15 Necco St.) last year. But that liability would be mostly erased this year if GE takes advantage of the $500,000 break the city owes GE for fiscal 2019. That gift is scheduled to increase in size steadily, from $700,000 next year to $1.3 million in 2024, before hitting $1.5 million in 2025. That’s when the job requirement kicks in. GE will need to employ at least 800 people there in 2025 to take advantage of the full tax break through 2037, or at least 400 to get any tax break at all. Without a tower, the property’s value probably wouldn’t climb as quickly as city officials anticipated when the deal was struck in 2016 to lure GE here from Connecticut. So GE’s tax bills might be smaller than expected, too. But this is a hot area of the city — so hot that Procter & Gamble is selling off 6.5 acres next door. When asked about the tower’s status, a GE spokesman referred to comments that vice president Ann Klee made in August, when she said phase two would still happen after phase one is done. But that, of course, was before the new boss arrived. Culp’s appointment adds a new level of uncertainty for the tower plan, but he can still get some tax relief from the city without digging one shovelful of dirt.